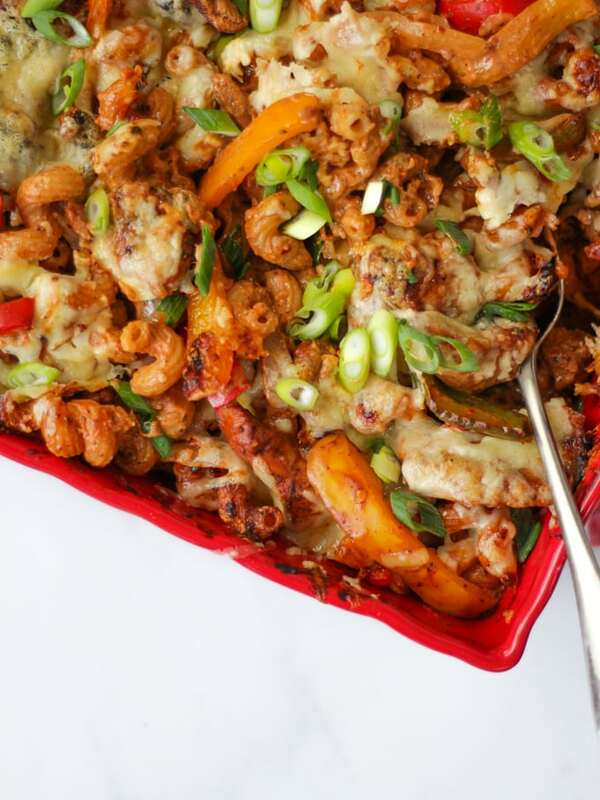 Chicken Fajita Pasta Bake Recipe - Easy & Delicious! 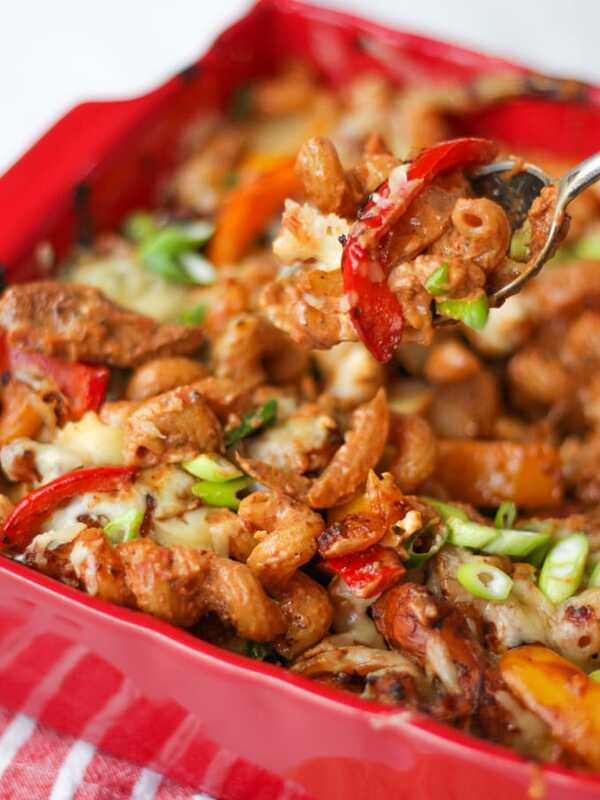 You are here: Home / Recipes / Chicken Fajita Pasta Bake Recipe – Easy & Delicious! 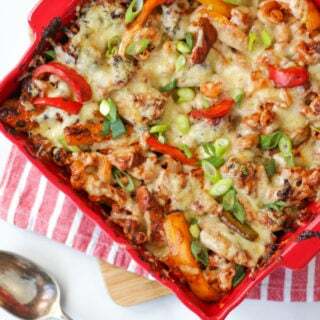 A simple and delicious Chicken Fajita Pasta Bake Recipe. Loaded with all of your favourite fajita flavours in a pasta bake. Tasty chicken, with delicious peppers and creamy cheesy pasta. A delicious family friendly midweek meal. This post was sponsored by Waitrose to show you some of my favourite items from the essentials Waitrose range. Thanks as always for your support. When I first lived alone in my 20s, Chicken Fajitas were on the menu often. Simple to make, tasty and they felt a bit exotic (arriba!) They were also fun to share and fairly healthy. Fast forward to busy family life and they are still a firm favourite here. I make them a little more mild to suit the children and everyone is happy. This week I thought I’d mix things up a bit and came up with a Chicken Fajita Pasta Bake, using pasta instead of our usual tortilla wraps. It was a big success here, tasty chicken, creamy pasta and melting cheese – what’s not to love?! I made this Chicken Fajita Pasta Bake dish using mainly ingredients from the essential Waitrose range. 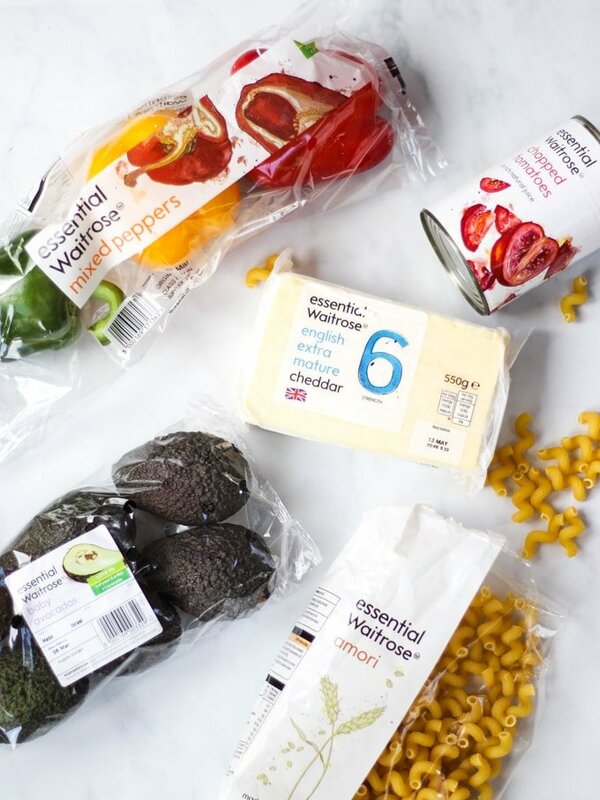 The essential Waitrose range, is a range of products which provide the quality you’d expect from Waitrose at prices you perhaps wouldn’t. In this recipe I used essential Waitrose Amori Pasta (the children LOVE this shape), tinned chopped tomatoes, cream cheese and mixed peppers, amongst others. I was so impressed by the quality of everything we used. The peppers were big, fresh and delicious and the cheddar cheese, super tasty. How do you make Chicken Fajita Pasta? 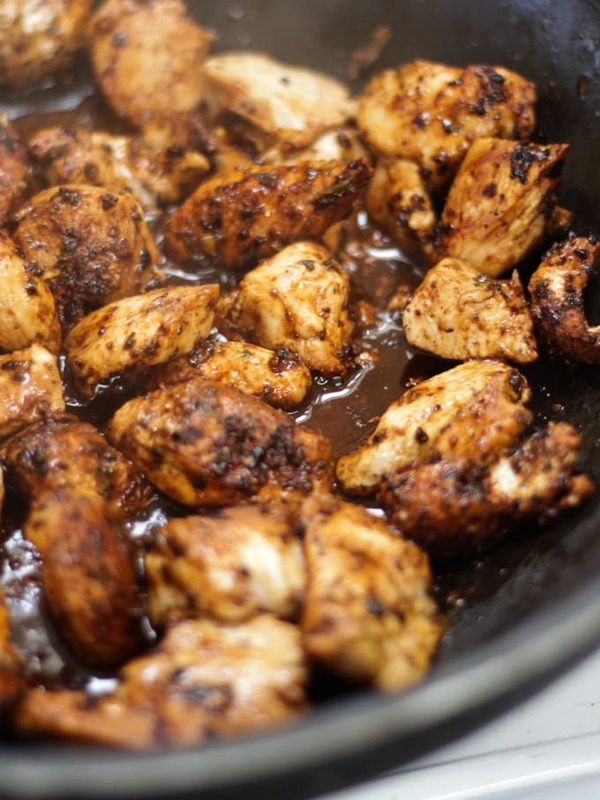 This is a really simple recipe, just fry off some chicken breast pieces (you could use chicken thighs if you prefer) with fajita seasoning. Set them to one side and pan fry onions, garlic, peppers (capsicum) with more fajita seasoning. When the vegetables are just starting to blacken a little, add back in the chicken, along with tinned tomatoes, cream cheese and seasoning. Mix into cooked pasta, pop into a dish and top with cheese. Melt the cheese under the grill and serve. 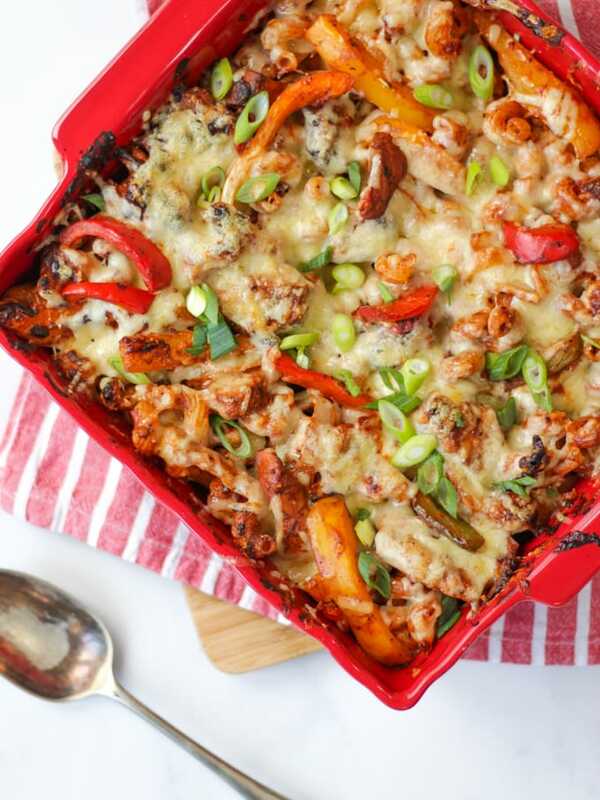 Can you freeze Chicken Fajita Pasta Bake? Yes, this recipe freezes one cooked with no problems. Be careful not to overcook the pasta if you reheat it, it can go a little soggy. If we have leftovers, when it’s cold, I portion it up into takeaway containers to eat for my lunches during the week (I buy them in bulk from Amazon, about £8 for 50). 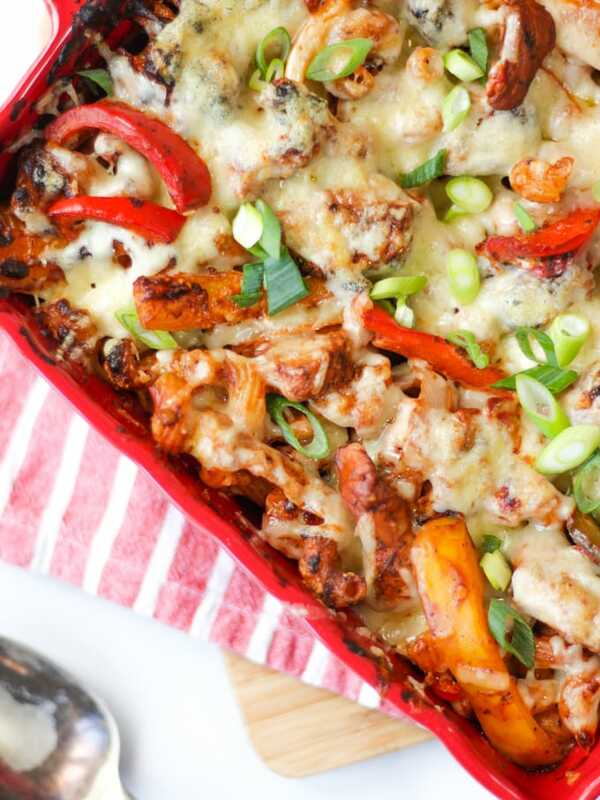 Is Chicken Fajita Pasta Bake healthy? This is a reasonably healthy family recipe, giving at two to three portions of vegetables and using only lean meat. If you want to make it even healthier you could try using brown pasta to increase the fibre content. You could also omit the cheese on top to reduce the fat content significantly. Use your favourite fajita seasoning mix, I tend to use a mild one for family meals but feel free to mix it up with something hotter if you prefer. Replace the peppers with a jar of ready roasted red peppers, drained, if you want to save time. I like to serve this with sliced avocados, sour cream (or yoghurt) and sprinkled with chopped spring onions (scallions). You could replace the cheddar cheese with mozzarella if you prefer a more ‘melty’ or mild flavoured cheese. 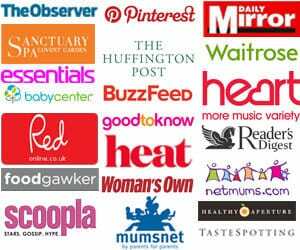 Fancy some other easy chicken recipes? How about my Easy Chicken Curry or my Chicken Pesto Bake? Hope you enjoy this recipe as much as we do. 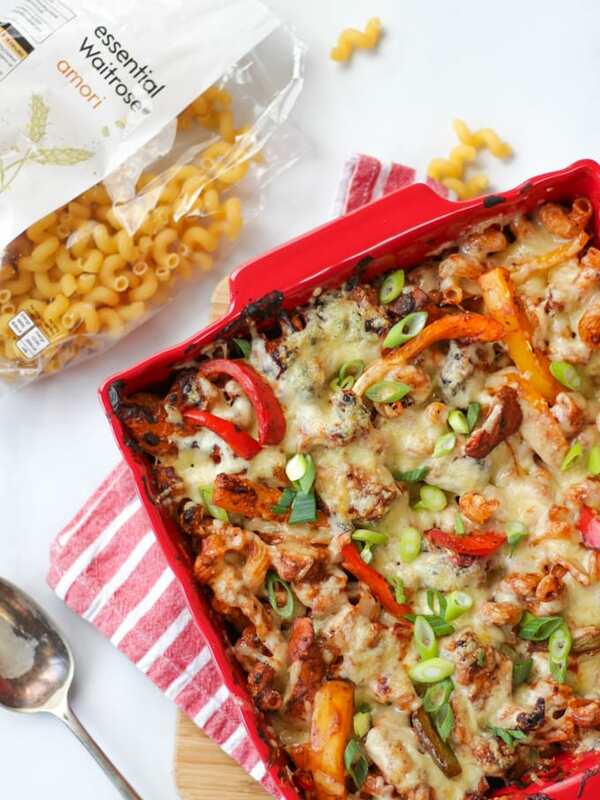 I’d love to know how you got on and what you thought of it if you make this Chicken Fajita Pasta Bake recipe. Please rate the recipe and leave me a comment below if you do. Cook the pasta until just cooked through, drain and set aside. Heat half of the olive oil in a frying pan. Add the chicken and half of the fajita seasoning. Cook for about 10 minutes until cooked through. Remove from the pan and set aside. Heat the remaining olive oil in the pan over a high heat, add the garlic, onions, peppers and remaining fajita seasoning and cook until slightly blackened at the edges. Add the chicken back to the pan with the cream cheese, tinned tomatoes and plenty of salt and pepper. Stir until combined and add the cooked pasta. Stir through and then pour into a shallow dish. Top with the cheese and put under a hot grill until the cheese is melted. Serve with peeled and sliced avocado, sour cream, lime wedges and a sprinkle of herbs. Disclosure: This recipe was sponsored by Waitrose, as always all opinions are truthful. Thanks for reading. Does the cream cheese get mixed in with the pasta or spread on top? Many thanks! Making this tomorrow for a big family getogether! This sounds delicious! Definitely going to try this! This was a very tasty dish, I came across your website the other day and chose this recipe on a whim . Me and my family loved it especially my girls. Definitely trying out more recipes. Just made this for dinner tonight! Looks amazing…Can I just put it in the oven when the kids are home from school?